August 14th this year (2011) is the Main Day for this beautiful festival that is an unforgettable experience. It is set in a charming small town next to a river. Bahia’s Recôncavo, 116 kilometers away from Salvador. This year, the event will last five days, from August 13 to 17th, and starts with a cortege along the streets of the historical city, a sign of mourning for the death of Our Lady. The Sisterhood of Our Lady of the Good Death is composed by a fraternity of 23 women where the requirements to become a member are being Afro-descendant and more than 50 years old. They are all united by the devotion to Our Lady. According to local historians, the fraternity was created when a group of women, former slaves, united forces to buy the freedom of other slaves in the city of Cachoeira. The Sisterhood Festival has strong syncretism features and receives influences from the Catholic Church and Candomblé, a very powerful religion in the Recôncavo. During the festivities masses are carried out at Our Lady D’Ajuda Chapel and typical dishes of the Afro-Brazilian cuisine are served. 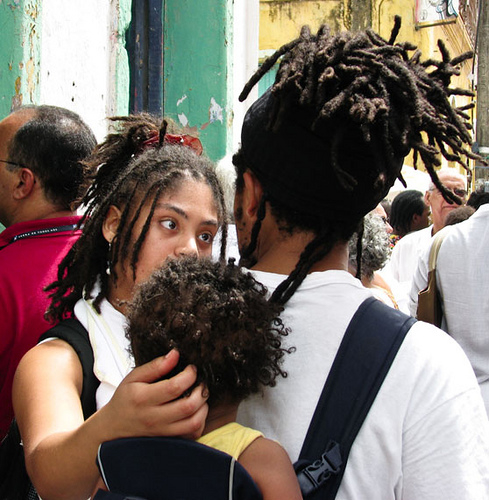 The tradition of this sisterhood was recognized as Bahia’s Immaterial Heritage last June, and they started to receive support from the state government. Our Lady of Good Death Festival attracts thousands of tourists to the city of Cachoeira, during the month of August, especially Afro-Americans that are interested in the cultural aspects of the Afro-descendant people. For those who wish to know more than the beauty of the festival, it’s also a good idea to enjoy the tranquil atmosphere of this historical city. Listed by the Institute of the National Historical and Artistic Heritage (Instituto do Patrimônio Histórico e Artístico Nacional – Iphan), the city has a baroque architecture, besides beautiful churches with paintings and Portuguese tiles. Cachoeira also offers boat tours in Paraguaçu River, a great option for tourists who like nature. Besides the religious program, the festival will also have several local attractions, such as the samba de roda groups Dona Dalva, Filhos do Caquende, Filhos da Barragem, Filhos de Nagô and Filhos do Varre-Estrada. The Afro-baroque group Gegê-Nagô will certainly be present this year as they do since 2003, when the group was created. Formed by people from Bahia’s Recôncavo, the Gegê-Nagô will make a presentation to enrich even more this cultural manifestation. Inspired by the 1970’s group, Os Ticoãs, they will take to the stage their rhythm inspired in the drums of Candomblé, with new versions of the pioneer group. 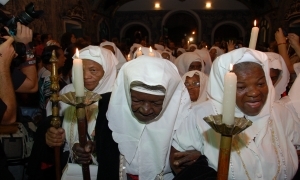 13/08 – Ritual of the transfer of Our Lady’s coffin, at 6:00pm, leaving from the annex of D’Ajuda Chapel towards the chapel of the Sisterhood, on 13 de Maio Street, where a religious celebration will be held in memory of the deceased sisters. 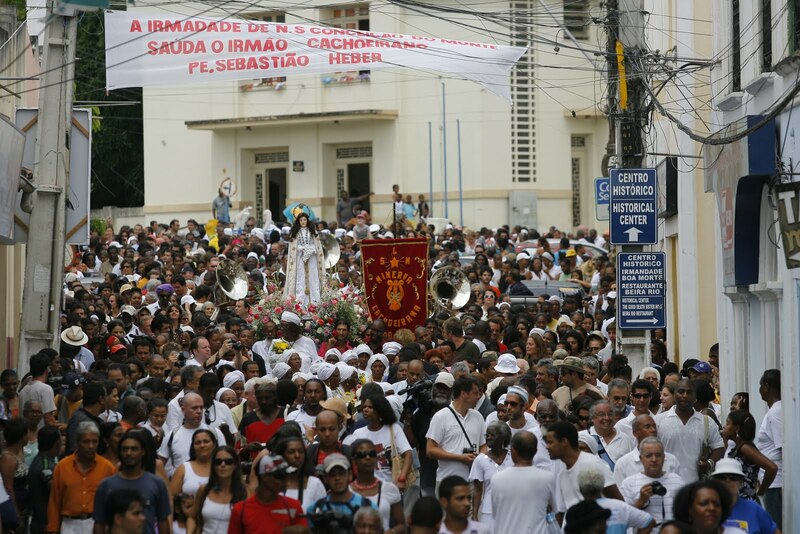 14/08 – The cortege of the funeral of Our Lady leaves at 7:00pm from the Sisterhood’s church and goes along the main streets of the historical center of Cachoeira, followed by philharmonics that play mournful songs. 15/08 – The cortege leaves the Sisterhood’s church, after the 8:00am mass. Members of the sisterhood wear a special costume and jewelry showing the red side of their shawls. The Sisterhood offers a plentiful banquet with feijoada (dish prepared with beans and salted meat), roasted meat and salads. 16/08 – The Sisterhood offers the population the traditional escaldado, prepared with various kinds of meat and vegetables. There’s also a samba de roda presentation when people can dance. From 6:00pm. 17/08 – From 6:00pm the festivities go on with the samba de roda of Our Lady when caruru (typical dish prepared with okra and palm oil) and mugunzá (made with corn) are distributed. We absolutely love taking people to this festival and the town of Cachoeira. You definitely don't want to miss this special event. Look forward to seeing you there! Please Click Our PayPal Button to Pay for Your Tour or Visit Our Secure Payment Page Here.